I love muffins. I mean who doesn’t want to eat cake for breakfast. I don’t like them overly sweet, and fruit is always a must. 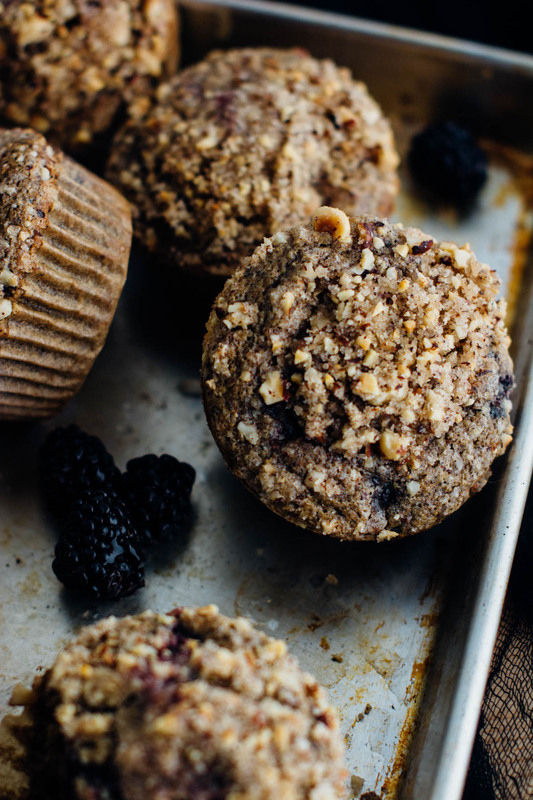 These hazelnut blackberry muffins are full of whole grains, nuts, and juicy blackberries. 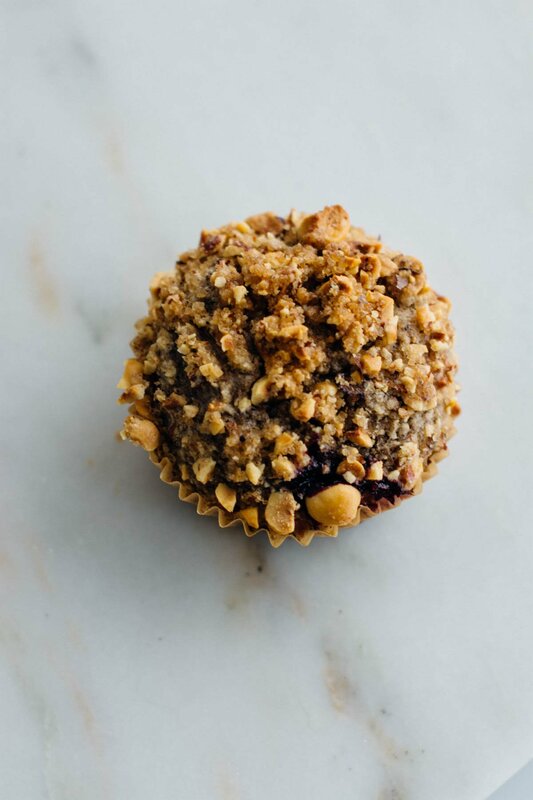 This recipe is inspired by Kim Boyce, she’s a James Beard award-winning baker and owner of the fabulous Bakeshop here in Portland. I am a huge fan of her pastries and cookbook. Good to the Grain is chocked full of fantastic tips, tricks, and delicious dishes. I have been baking my way through it and never been disappointed. I know that I love this book because it is starting to get a bit dog-eared and covered in flour. 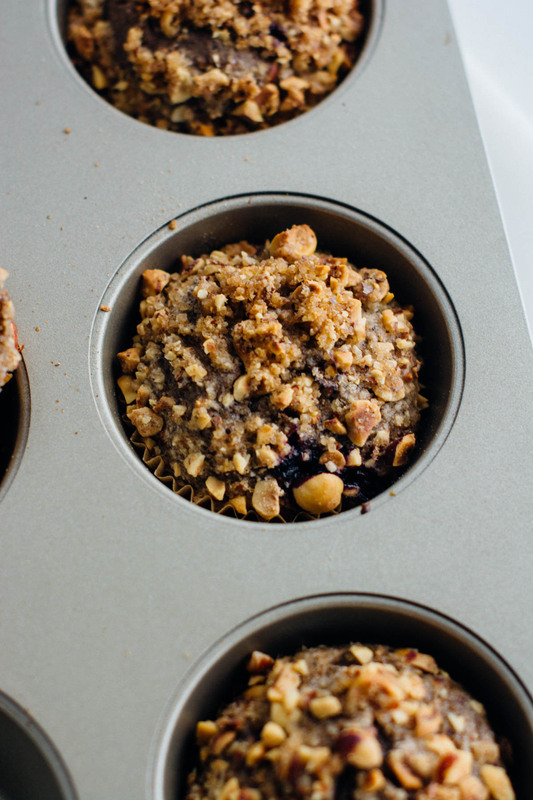 This weekend, bake up a batch of these muffins, pop them into the freezer, and you can reheat them in the morning whenever you are short on time. I used hazelnut flour and if you have trouble finding it you can grind hazelnuts in a food processor or high-speed blender just until it is finely ground. Be sure not to process it too long or you’ll end up with hazelnut butter. 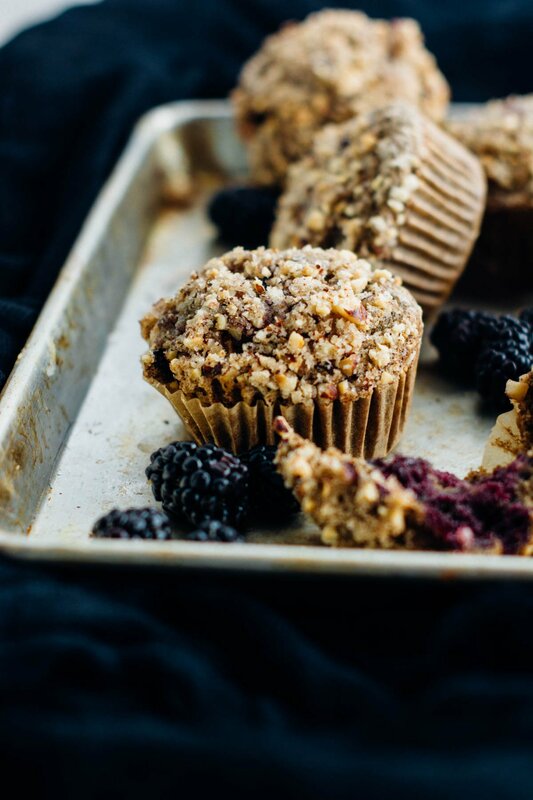 The muffins are dairy-free and can be vegan if you use a chia egg, by combining 1 tablespoon of ground chia seed with 2 tablespoons of water and letting it sit for 5 minutes to thicken before adding it to the rest of the wet ingredients. 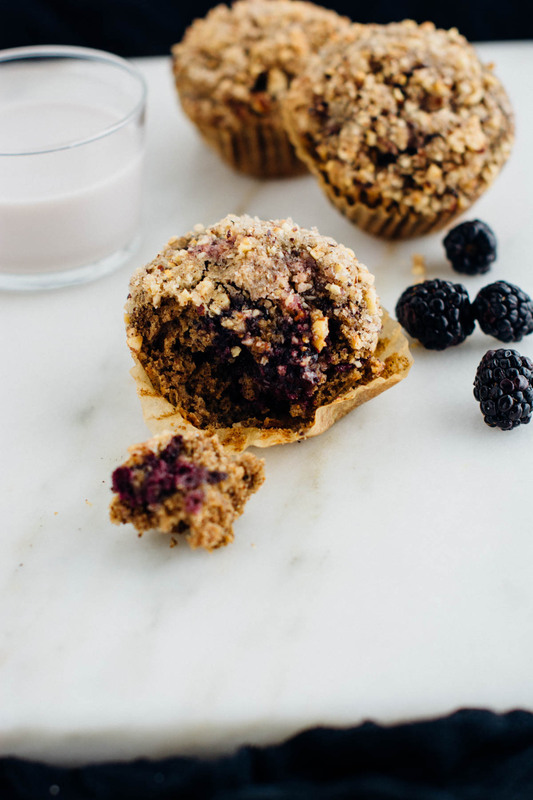 These hazelnut blackberry muffins are made with whole grain flours, are dairy-free and are easily made vegan! Pre-heat the oven to 350 degrees and line a 12-cup muffin tin with 10 paper liners. Sift the dry ingredients into a large bowl and add any bits that may remain in the sifter. 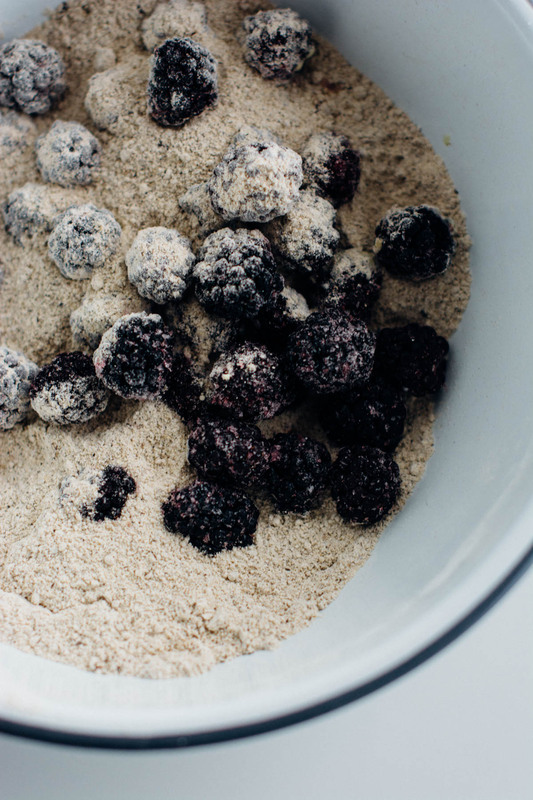 Add the blackberries and toss gently to coat with the flour mixture, this will help keep them from sinking to the bottom of the muffin tins. Combine all the wet ingredients in a medium bowl and whisk well to combine. Using a spatula, mix the wet ingredients into the dry and gently combine. 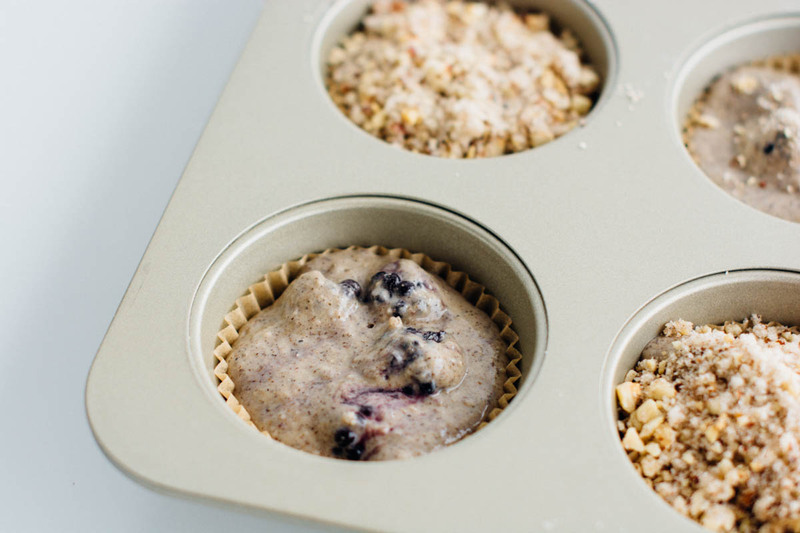 Scoop the batter into 10 muffin cups using a `1/2 cup measuring cup or ice cream scoop. 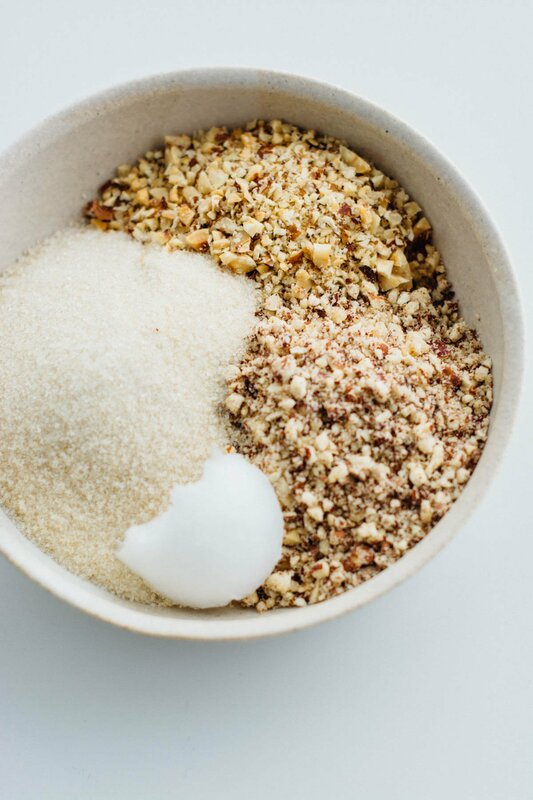 In a small bowl stir together the hazelnut meal, chopped hazelnuts, cane sugar, cinnamon, cardamom, and coconut oil. Sprinkle the hazelnut topping over the batter, gently pressing it into the batter. Bake for 24 to 28 minutes or until they smell nutty are golden brown and spring back slightly in the middle. 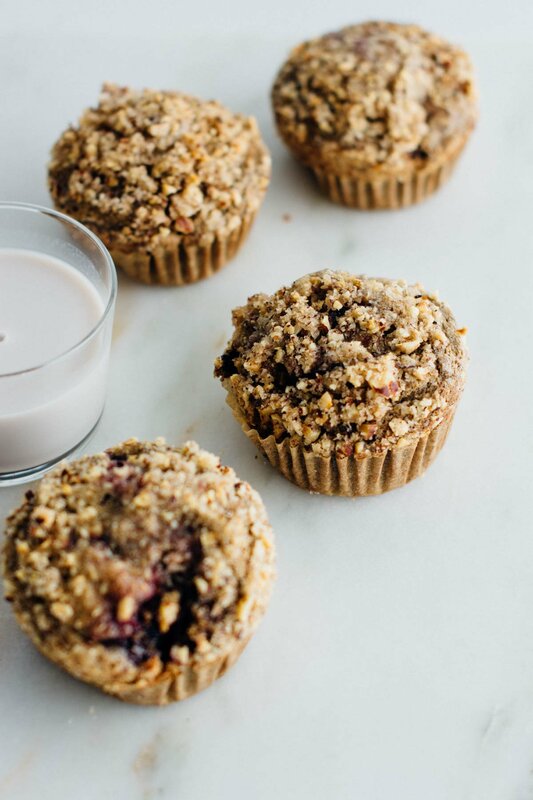 When you remove the tins from the oven, remove the muffins from the tins and place them on a cooling rack or place on its side in the muffin tin to ensure that the muffins don't get soggy. 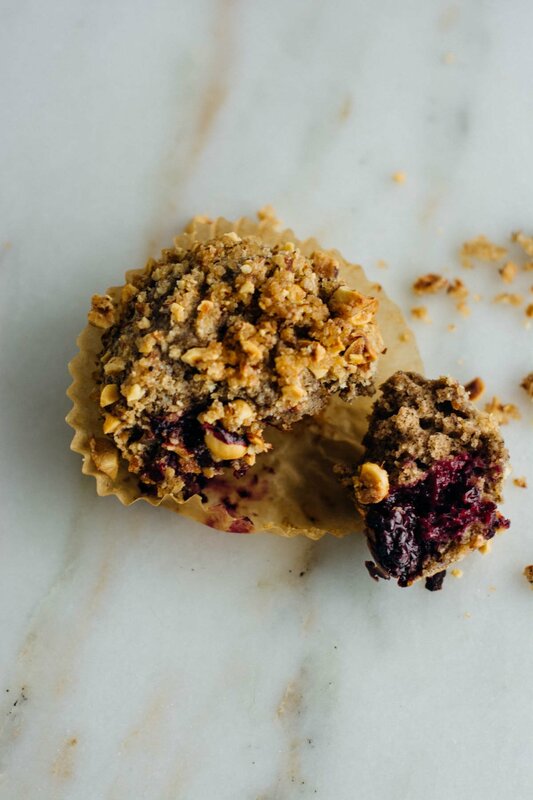 Muffins are best the day they are made but they will keep for 3-4 days in an airtight container or freeze individually and reheat for 45-60 seconds in the microwave. * To make a chia egg, combine 1 tablespoon ground chia seed with 2 tablespoons water, mix well and let sit for 5 minutes to gel.